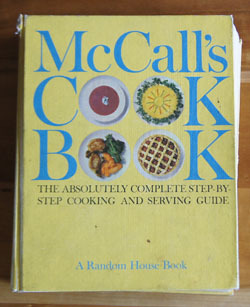 Cookbook #220: McCall’s Cook Book, by the Food Editors of McCall’s, McCall Corporation and Random House Inc., 8th printing, NY, 1963. This treasure is my mother’s copy of my book of the same name, as covered in my 2016 blog post. The cover on her book is yellow, and mine green. She took better care of her copy – didn’t have to tape the back binding together. Inside the front cover, she scotch-taped several bits of useful information. One is a newspaper clipping from a Q/A article on can sizes. In the early twentieth century, cans were sold by sizes “No. 2, No. 10, No. 203” etc. Her clipping translates those values into weight and volume values. (Of course, nowadays we just google for an answer.) 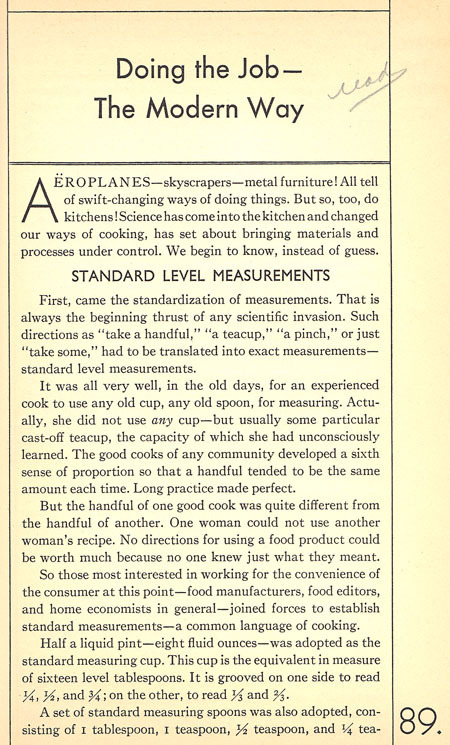 She also clipped a table of weights and measures for fruits and nuts, and a table of food volumes before and after cooking. And tucked in with these tables is a “how much equals how much?” for fruits and vegetables. Yup, she used this cookbook as a reference. 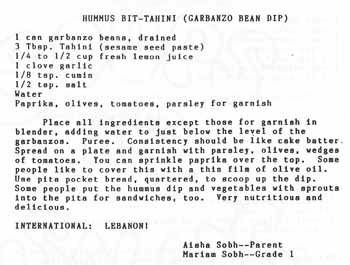 I remember that she always put the exact amount of each ingredient called for in a recipe. If she had a couple tablespoons from a can of olives left over after measuring, those olives did not go into the bowl. Today we can buy quick breads in coffee shops and markets. Like banana bread. 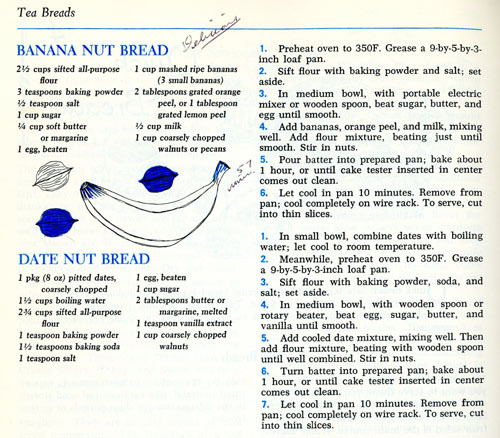 Mother marked “Banana Bread” in her edition of McCalls Cook Book. I have about 3 or 4 banana bread recipes – I rotate through different versions, but most of my recipes call for vegetable oil – this one uses butter or margarine instead. Might be interesting to try. Seems I often have ripe bananas to use up! The next recipe she marked is for “Perfect Muffins”. 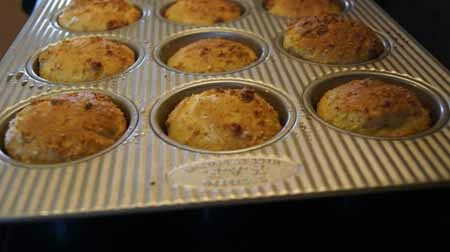 I like the introduction to muffns: “These are absurdly easy to make. 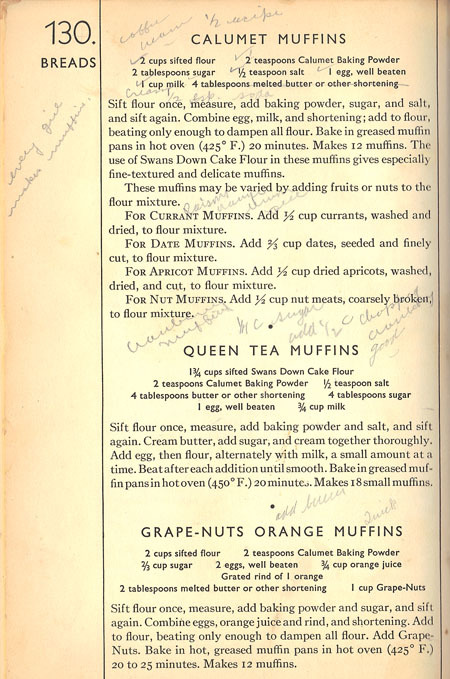 What is known as the ‘muffin method’ – that is, adding all the liquid ingredients to all the dry – is often used for other quick breads and for simple cakes, as well.” Perfect Muffins is a basic recipe that can be modified – eight different suggestions are listed on the following pages. 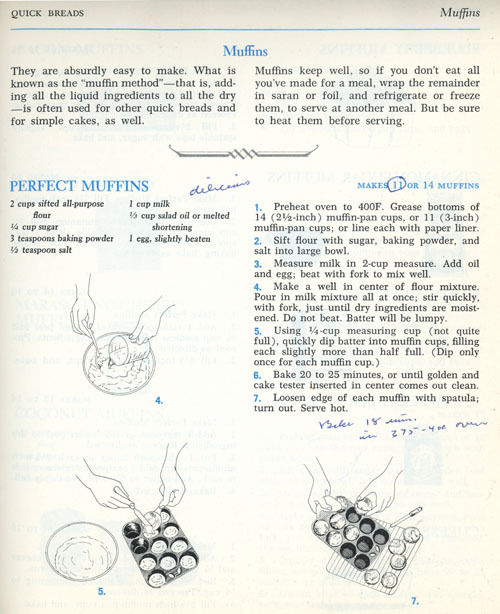 I like the way she circled “11” on the number of muffins to make; she also changed the baking time and temperature. I continue paging through. My goodness, her book is in such better condition than mine! She put a red check but no comments next to a recipe for sour cream in pancakes – I’d like sour cream in pancakes too. The recipe pages for “McCalls Basic White Bread”, a yeast bread, look well used. She thought the Honey-Whole-Wheat Bread was delicious. Mother must have made homemade pizza, although I never remember her cooking it. She liked the McCalls recipe for homemade crust. Plus, she tucked several magazine-clipped recipes for pizza sauce inside the book. These sauce recipes are similar to the ones I found on SeriousEats a few weeks ago. She thought the Old-Fashioned Applesauce Cake was “delicious”. 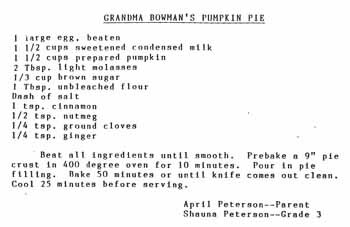 I’ve used this recipe too; I sometimes made this cake into cupcakes, too. In fact, I think I’ll make it again soon, it is a very good cake. Especially with icing! Peanut Butter Pinwheels sound really, really good (she marked them “delicious”). 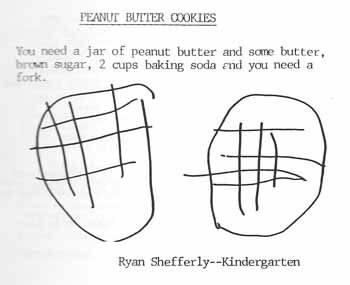 I never remember having one of these cookies: a peanut butter dough rolled out, spread with chocolate, rolled into a log, sliced into cookies. On the recipe Chili Con Carne in Red Wine, she commented it was “Pretty good, kinda runny”. I think she served it with the suggested Polenta Squares, a recipe later in the book, because she commented at the polenta squares “Good – I like it”. This makes me chuckle. I too like tomato-based sauces over polenta. I just discovered home-cooked polenta a few years ago. My dining partner sort of likes it, and I can imagine my father felt the same way. So her “Good – I like it” is a sort of rebellion. 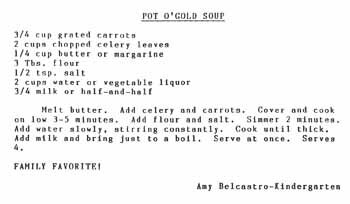 (I had no idea she ever tried a polenta dish.) She liked the deep fried Corn Fritters, but thought the Chili Con Carne only “fair”. Now we get to desserts. Looks like she tried the Chocolate Roll with Mocha Filling. Not enough filling, she wrote, and suggested to double the recipe. She thought the French Apple Cobbler “delicious!”. In the Eggs, Omelets and Souffles chapter, she tried the Scrambled Eggs a la Suisse and thought them “pretty good – but not great”. This is a brunch egg dish. I had another surprise when I found that she made and liked the cheese souffle. Just like pizza, I never remember her making souffles. Eggs Benedict get a “delicious”. Pickled beets get a “delicious”, and Rolled, Stuffed Flank Steak gets a “delicious!” written in red and underlined. She made some changes in the Corned Beef and Cabbage recipe. The Pies and Small Pastries chapter comes next. Why it is not with the “Dessert” chapter reminds me that this cookbook has an odd organization (I noted this when I covered my own copy). She tried the Fresh Apricot Pie and has notes on the number and size of apricots she used, plus a note that she cut them in quarters instead of slicing. In Salads and Salad Dressings, she liked the Raw-Spinach Salad. In the Sandwich and Sandwich Filling chapter, she thought the Hot Crabmeat-Salad Sandwiches “just so-so”. In Sauces and Gravies, she marked “Mock Hollandaise Sauce” as “very good”. This sauce is used for Eggs Benedict in an earlier chapter. In Vegetables and Potatoes, Eggplant-and-Tomato Casserole is marked “very good” and “Paul likes”. She liked Amelia’s Potato Pancakes and Honey-Spice Acorn Squash. And in the Leftoverschapter, Pork Chop Suey is marked “Very good”, and she adds “Serve with dry Chinese noodles”. This brings me to the end of the book, and all of the recipes she marked. I certainly enjoyed going through this cookbook of hers. Brought back lots of memories. And now, what to make for this blog? I decide on the “Perfect Muffins” (a scan of the recipe is above). I make a lot of muffins, but don’t pay exact attention to the proportions of flour, sugar, liquid, and shortening. Perfect Muffins gives just that: correct proportions. 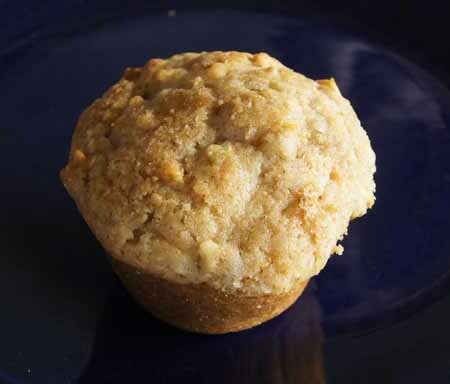 You could use this recipe to make any flavor of muffin – though I doubt it will work when large amounts of wet fruits (like bananas or apples) or vegetables (like carrots or sweet potatoes) are added. But if you want to add dried blueberries, or maraschino cherries, or nuts or spices, or some other interesting ingredient that catches your eye, Perfect Muffins is a great start. I consider it part of my ever-growing knowledge of muffin making. I choose the variation of Perfect Muffins that adds raisins and oranges. I made them just like the recipe, except I took Mother’s advice and used her altered baking temperature and time. Stir together the flour, sugar, baking powder, salt, and raisins in a large bowl. In another bowl, combine the milk, vegetable oil, egg, and orange peel; whisk to combine. “Make a well” in center of flour mixure (I rarely “make a well”, but this is the way the traditional directions for combining wet and dry ingredients read). Pour in milk mixture all at once, stir quickly, just until the dry ingredients are moistened. Do not overmix! Batter will be lumpy. Fill muffin cups just slightly more than half full. Bake at 375˚ for 20 minutes, or until they test done with a toothpick. These muffins are cake-like, or cupcake-like. The muffins I make are usually packed with bananas or apples or carrots, or whole grains, so to us, they tasted “less-healthy-than-usual”. Although, after my first bite of one of these muffins, I just wanted . . . more! 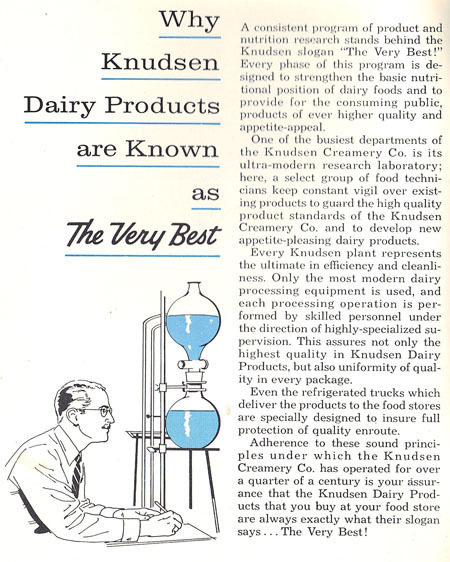 Cookbook #212: Knudsen Recipes, Knudsen, Knudsen Creamery Co. of California, 1958. 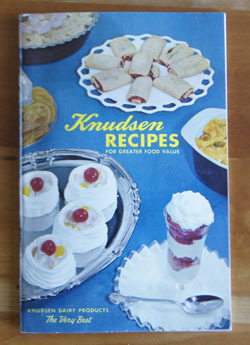 This is the third of my mother’s “Knudsen Recipes” cookbooks that I have covered: 1953 was the first, 1955 the second. And as in the 1955 edition, it is a woman who is doing the cooking, or at least reading the cookbook. The first section is Appetizers and Spreads. 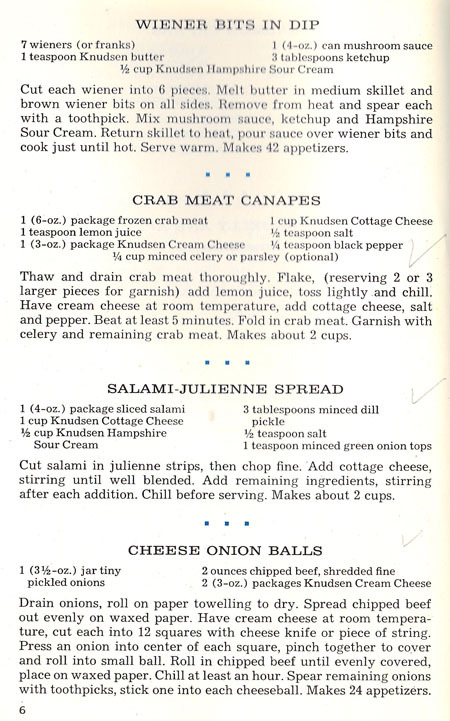 Mother marked several: Crab Meat Canapes, Salami-Julienne Spread, and Cheese Onion Balls. These are all made with cream cheese, cottage cheese, and/or sour cream, with additions of canned or frozen products. 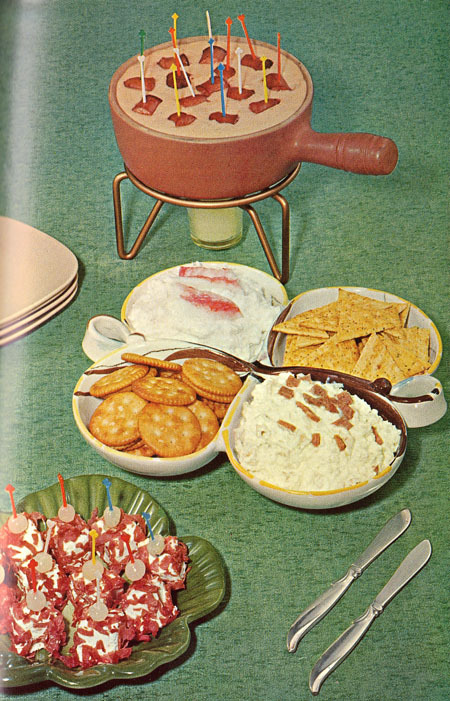 During the 50s, and especially during the cocktail hour, these types of appetizers were a mainstay of American cookery. Next is Salads. Mother put a check mark on “Carrot and Red Cabbage Salad”. I thought about making this salad, since I like the combination of carrots and cabbage, but this recipe has more sour cream than I think I’d like. A “Full Meal” salad mixes leftover cooked meat with canned or fresh vegetables and a lot of cottage cheese and sour cream. Not for me. Nor are the molded salads. I guess this whole chapter is just not for me! 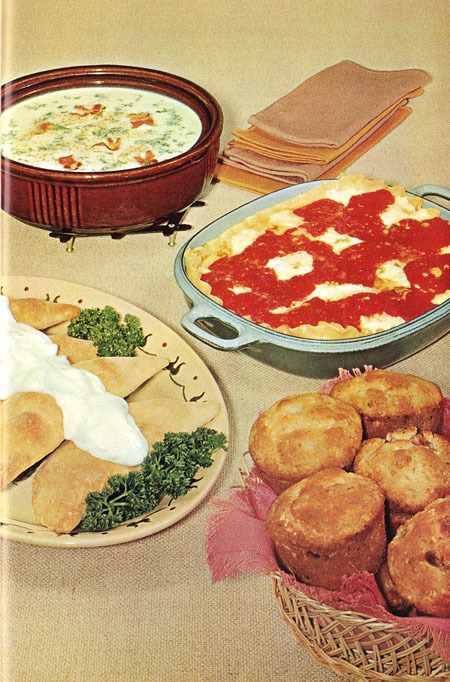 In the Main Dishes chapter, most of the recipes use about a cup of sour cream and/or cottage cheese per recipe. “Spaghetti with Beef in Hampshire” is a dish of steak, herbs, canned mushrooms, canned tomato soup, Worcestershire sauce, and sour cream, cooked and served over spaghetti. “Spaghetti Cheese Pie” is cooked spaghetti spread in a pie pan and covered with bacon, mushrooms, eggs, cheddar cheese, and cottage cheese and then baked. 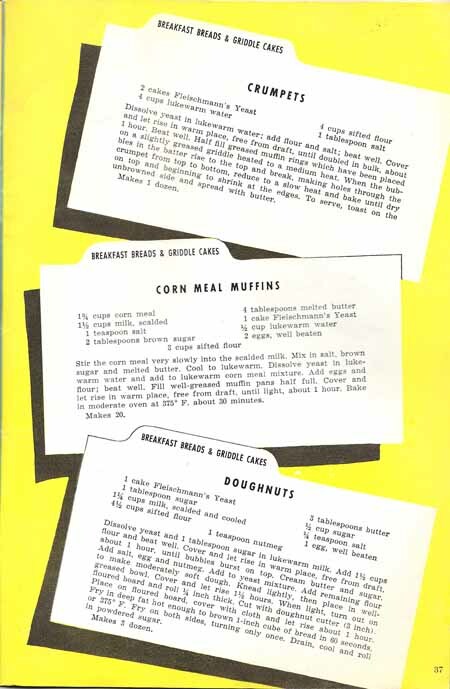 Both of these typical homey 50s recipes might taste good, but just aren’t the way I cook today. 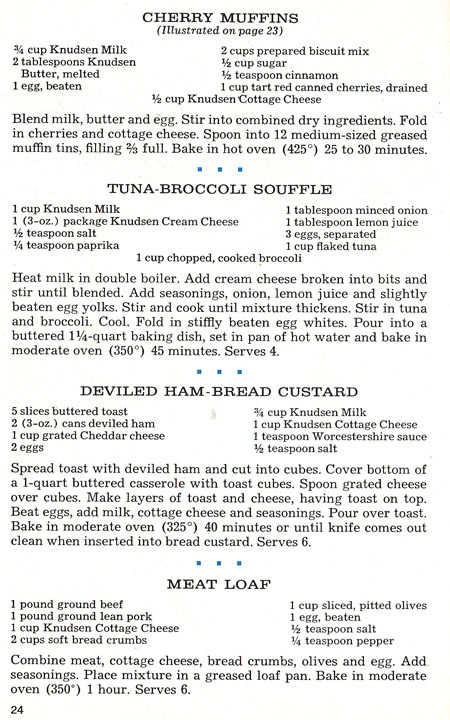 “Baked Potato, The Great American Dish” – baked potatoes with sour cream and chives – was also in the 1955 edition of Knudsen Recipes. Right in the middle of the Main Dishes chapter I find a recipe for “Cherry Muffins”. Why here? I really don’t know. 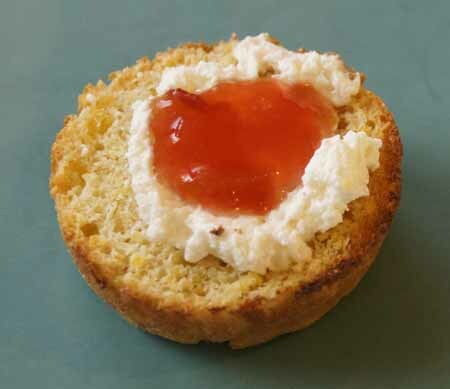 But I like the recipe, because I am always looking for new muffin recipes and this one has cottage cheese (protein and calcium) in the batter along with a can of tart red cherries (tart cherries are supposed to be good for you). Note all of the recipes on the page below: they are good examples of the type of recipes in this cookbook. Also in the Main Dish chapter is the following recipe for “Zucchini Dollar Cakes”. 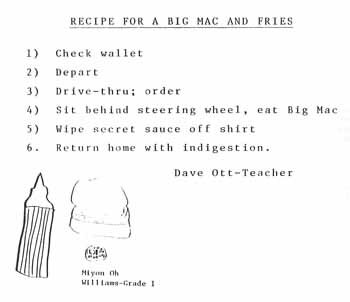 I think the recipe sounds kind of good. And it might come in handy in late summer, when all those zucchini squashes are out there. In the Vegetables chapter, most of the vegetables are heavily sauced. Except “Broccoli in Almond Sauce”, which has just a little sour cream. But it calls for frozen broccoli. I prefer a little seasoning on lightly cooked fresh vegetables. I do like the idea of adding cottage cheese to mashed potatoes, one of the other recipes in this section. Desserts and Sweets is the best chapter for recipes that include sour cream and cream cheese, in my opinion. We expect desserts to have calories, and getting those calories from milk products might be better for us. Examples are: “Cream Cheese Pie”, “Cheese Cake”, “Viennese Apple Strudel” (with cream cheese, butter, and a lot of apples), and “Sour Cream Boston Cheese Cake”. I am marking “try” on the recipe for “Hampshire Sour Cream Spice Cake”, with cottage cheese, sour cream, and lots of spices. It is baked in a bundt pan. 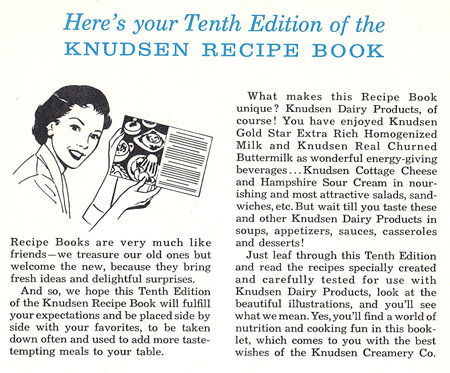 The closing pages of Knudsen Recipes include lists of menus, ideas for using Knudsen products for “weight control for better health”, and a table of calories in a few foods and recipes in this cookbook. I decide to use a combination of unbleached all purpose flour and whole wheat pastry flour, and to use butter instead of vegetable shortening. Also, the cottage cheese I have is very salty, so I am going to cut down the amount of salt. Below is my version of “Cherry Muffins”. Combine the flour(s), baking powder, salt, and cinnamon. Set aside. Put the egg in a good sized bowl and whisk it a few times. Add the sugar, milk, cottage cheese, and melted butter. Mix well. Chop the drained cherries. These cherries will be very wet and soft, and I didn’t get them totally drained. No problem, just scoop them into the bowl with the wet ingredients. Combine the wet ingredients with the dry ingredients and stir just until mixed. Put into 12 muffin cups. Bake at 400˚ 20-22 minutes, until golden brown and test done with a toothpick. These were a lot better than I expected! I was concerned that the cherries would not lend enough flavor to the muffins, but I was very wrong. Also, I often use vegetable oil in muffins, but used butter in these. Same calories, but what a difference in texture! These almost taste like pie crust. Success! 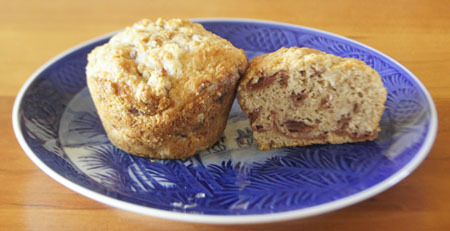 I was able to use healthy ingredients, like tart cherries and cottage cheese, to make delicious morning muffins. 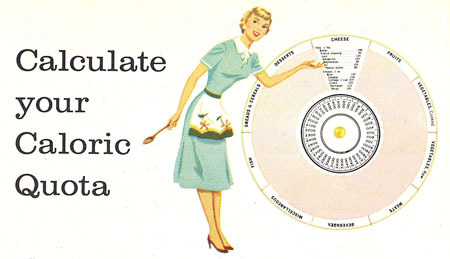 Probably current and future readers will find nutritional problems with my recipe, as opinions and science are in flux. But for now, I will enjoy my semi-healthy muffins! Cookbook #180: General Foods Cook Book, General Foods Corporation, NY, NY, 1932. Mother would have celebrated her 100th birthday this week. She loved celebrations! 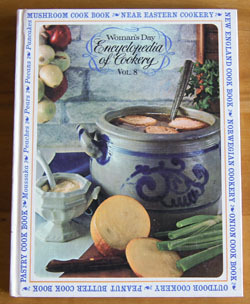 In her honor, I choose her vintage General Foods Cook Book to cover for this blog. 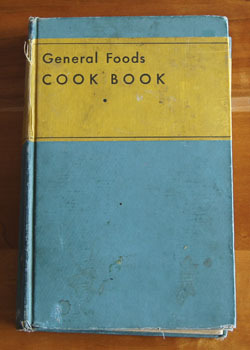 General Foods Cook Book was one of Mother’s textbooks when she attended Woodbury’s Business College from 1934-36. She would have been 18-20 years old at the time. On the inside cover are several notes about due dates for assignments, oven temperature notes, and some calculations. I remember from family history that she had attended this business school, perhaps more of a “secretarial” school. Obviously, since she had this General Foods Cook Book as a text book, she took a course in “home economics”. The culture of the time and place encouraged young women to stay at home and run their household, as their vocation, sort of like a business. I tell you, my mother, a traditional stay-at-home mom, would have been an excellent business woman! Our household ran smoothly, and she was a fast typist and great at keeping books and records. Woodbury’s Business College, founded in Los Angeles in 1884, was one of the first institutions of higher learning in Los Angeles, and also one of the first colleges in the West to admit women. At its beginning, Woodbury’s offered bookkeeping, commercial law, and telegraphy studies, it eventually expanded to fashion and inerior design and business administration, and by 1969 offered an MBA. In 1974, the school name changed to Woodbury University. My mother would have attended Woodbury’s while it was located in downtown Los Angeles. She wasn’t married to my father yet, so that means she had to travel about 30 miles from Covina to attend classes. I have no idea how she made the trip, by car? train? bus? What was it like in the mid-1930s in the LA area? Wish I had a time machine. By the time I was born, our young family was living in Burbank. In 1985, Woodbury’s re-located to Burbank, on the old Catholic school campus known as Villa Cabrini. So many times as a child or teen I passed the Villa Cabrini school – and now it is the home of the college my mother attended, so long ago. As you can tell, this cookbook has a lot of meaning for me. I definitely will keep it, if just for the memories! 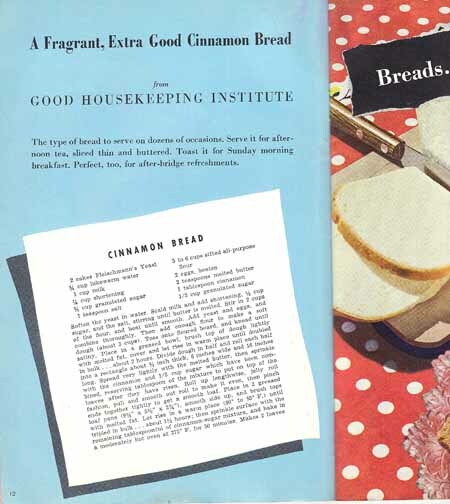 General Foods Cook Book teaches young women how to run their household like a business, promotes General Foods products, and has a lot of recipes. The best way to tell you about this cook book is to let you read a few pages. General Fooods was established by Charles Post in 1985 in Battle Creek, Michigan. 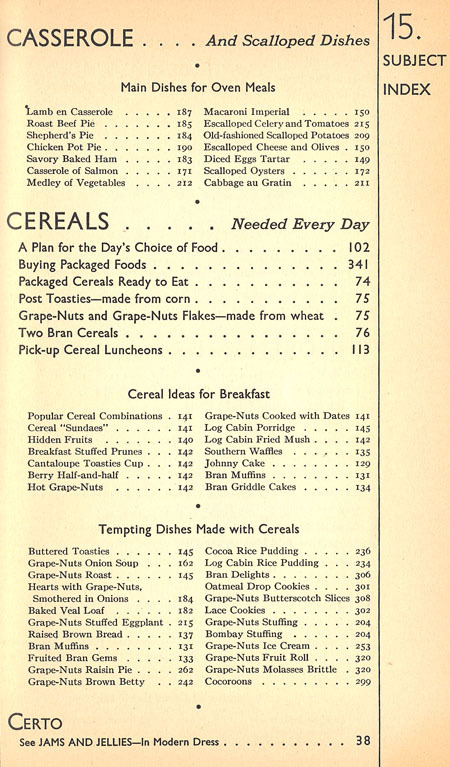 His poor health led him to experiment with food products, and out of his research Postum Cereal was developed, then Grape Nuts and Posts Bran Flakes. (Wikipedia has more information on the history of General Foods.) 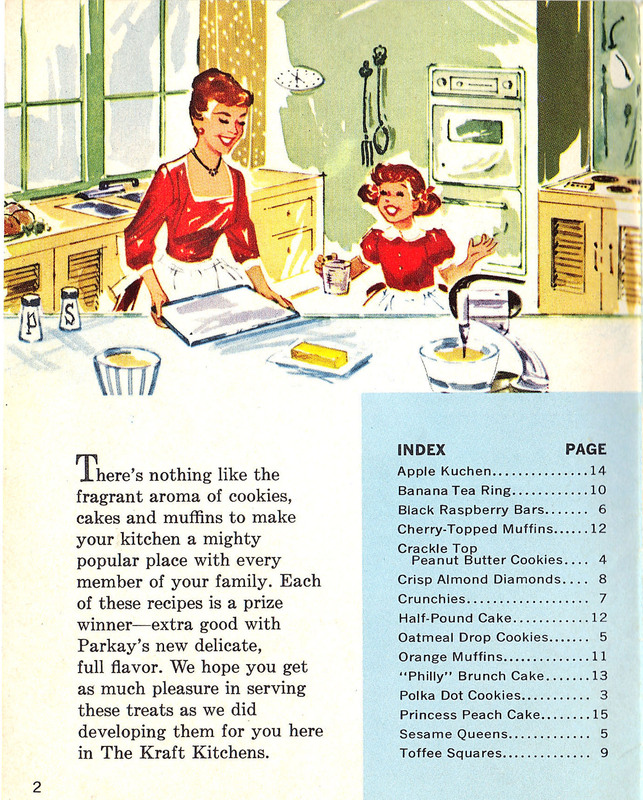 At the time of General Foods Cook Book’s publication, 1932, the company’s products included: Maxwell House Coffee and Tea, Sanka, Postum Cereal, Baker’s Cocoa, Post Toasties, Grape-nuts, Swan’s Down Cake Flour, Calumet Baking Powder, Jell-O, Minute Tapioca, Baker’s Unsweetened Chocolate, Baker’s Coconut, Certo (pectin), Log Cabin Syrup, and Diamond Crystal Shaker Salt. The energy value of each of these foods is discussed, as well as the proper way to store them. 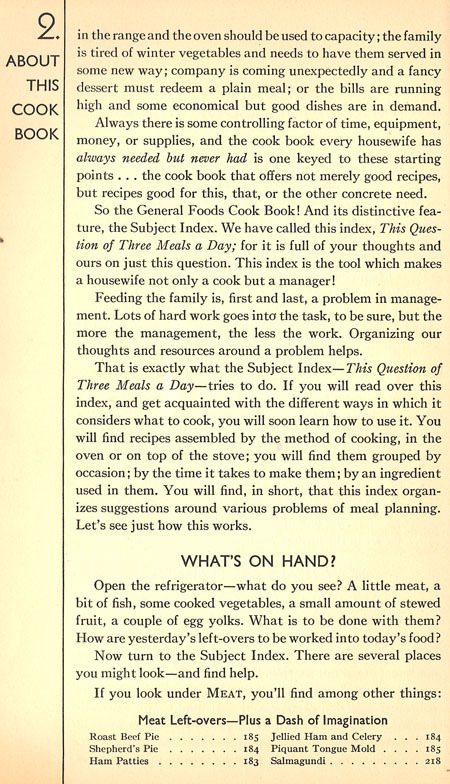 Later sections in this book discuss “how to provide an adequate diet” using General Foods products. Page 89 caught my eye. I smile at Mother’s note to herself: “read”. 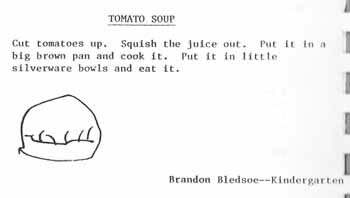 The rest of the book is recipes. I took a long time turning the pages and reading the old recipes, reading my mother’s notes. I spent two weeks on this cookbook – instead of the usual one week – for this blog. Some things cannot be rushed. I decide to buy a box of Grape-Nuts and make two recipes for this blog. First, Grape-Nuts Orange Muffins. 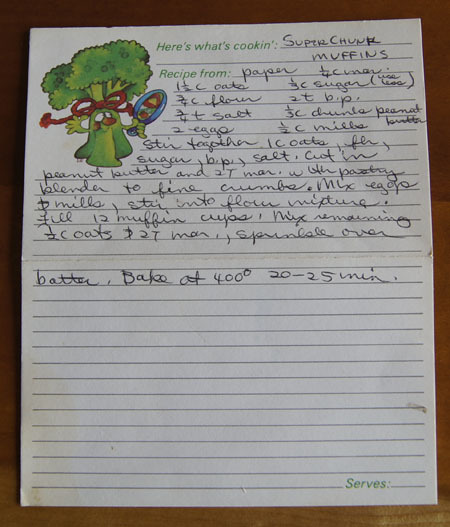 Note my mother’s writing on the left hand side: “every girl makes muffins”. Each recipe will require a few changes for successful baking in my own “modern” kitchen. But I am confident in my cooking skills and I know I will do the proper adjustments. I learned both how to cook and to love cooking from my mother. I am thankful to her every day of my life. Happy 100th, Mother. Wish you were here to enjoy these with us, your ever enlarging family. Stir together the flour and baking powder, set aside. Use a mixer to beat the butter, then add the sugar and eggs and beat well. Mix in the orange juice and rind. Add the flour mixture and mix only until just combined. Fill 12 (or 11, if you like them bigger) muffin cups and bake at 400˚ for 18-20 minutes, until they are lightly brown and test clean with a toothpick. Peel and slice the apples. 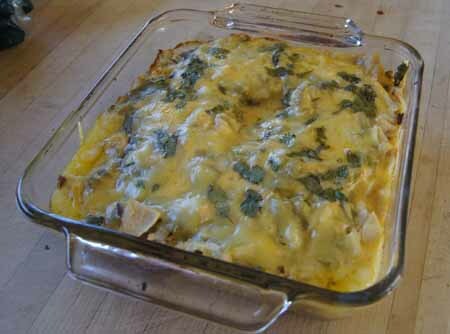 Place in an 8×8-inch baking pan. 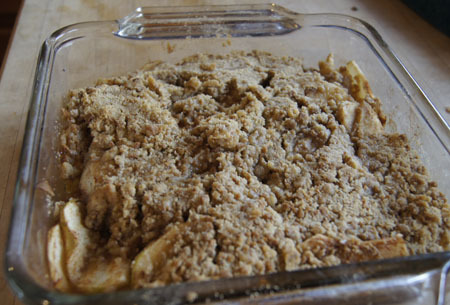 Mix the 1/4 cup white sugar with the cinnamon and pour over the apples. 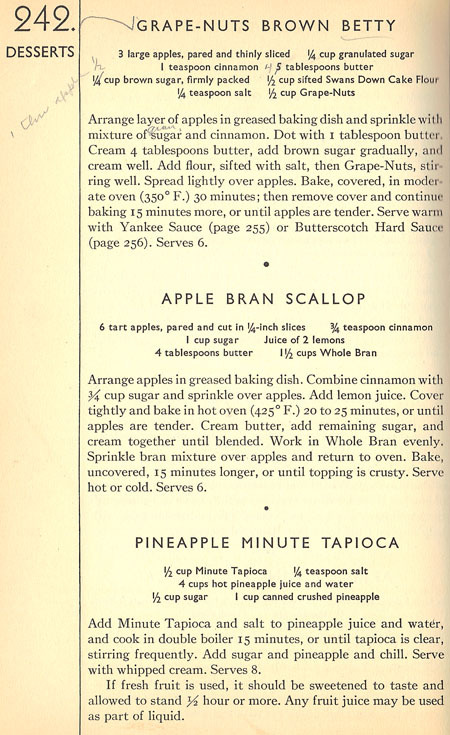 Mix in with your hands, then let stand about a half hour to macerate the apples. Beat 4 tablespoons of the butter with a mixer, then add the brown sugar and cream well. Add the flour and the Grape-Nuts and mix well (the mixture will be crumbly). Dot the macerated apples with the 1 tablespoon butter. Spread the Grape-Nut mixture over the top. Cover with foil and bake at 350˚ for 30 minutes, then uncover and bake another 15 minutes. 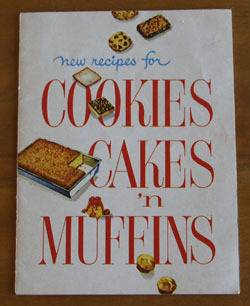 Cookbook #167: Cookies, Cakes ‘n Muffins, Kraft Kitchens, Chicago, Illinois, circa 1958. A mystery presents itself as I open Cookies, Cakes ‘n Muffins. What is the publication date? All it says is “The Kraft Kitchens, Chicago, Illinois”. Sleuthing-me sets out on the internet. 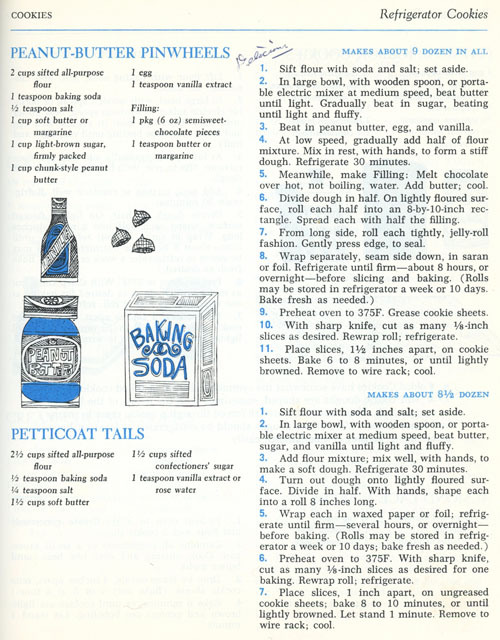 When did “Kraft” first emerge as a company name? Wikipedia tells me that James L. Kraft started a cheese business in Chicago in the early 1900s, and his brothers joined him to form “J. L. Kraft and Bros. Company” in 1909. By 1923, the Kraft brothers company was part of the National Dairy Corporation. In 1969, National Dairy changed its name to Kraftco Corporation. 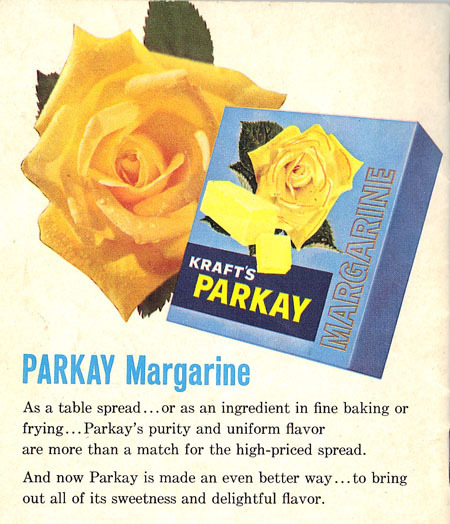 In 1976, its name changed to Kraft, Inc.
Maybe the phrase “Parkay margarine” will help me figure out the date. No, that clue is no help. 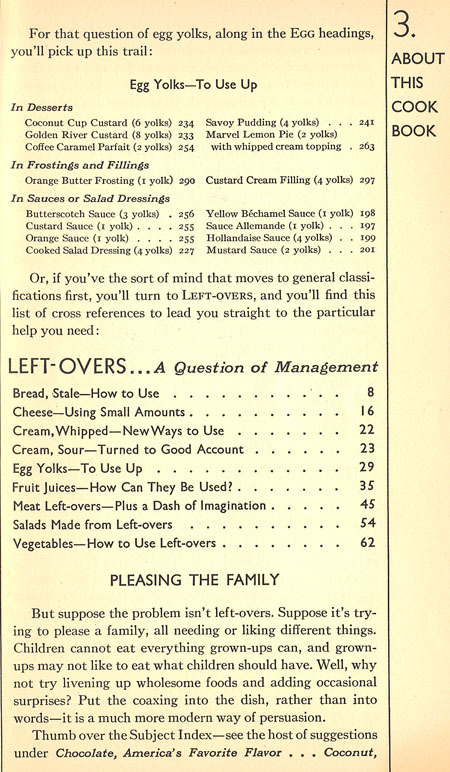 Except: the “butter” sales line of the 1973 commercial is not in this booklet. So my booklet must be before 1973. Therefore, this booklet was definitely produced before 1963. I follow the photo that looks like my cookbooklet to the page of origin. The photo is a Kraft’s Parkay Advertisement in Ebony Magazine, November, 1959. 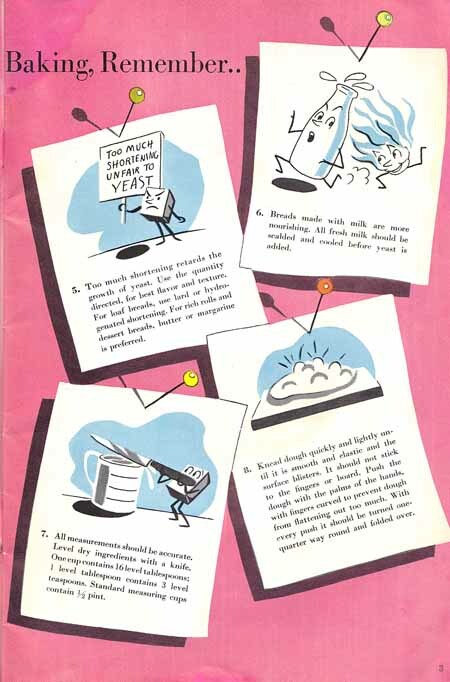 My conclusion: this booklet was published sometime in the late 1950s. I add with confidence the publication date of “circa 1958″. Whew. Now, to the cookbook contents: recipes. They are okay but pretty similar to recipes in other books. And, there aren’t many. Also, I like to use butter rather than margarine. The only reason I might keep this cookbook is that it is “vintage”. 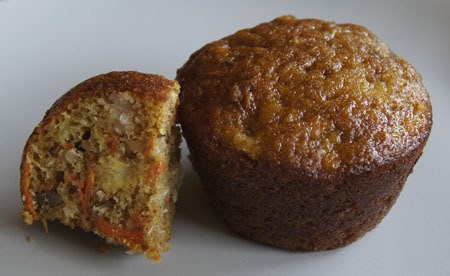 I decide to make “Orange Muffins” for this blog. I will use butter instead of margarine, and cut down the amount of baking powder – 1 tablespoon just seems like too much! The recipe says it makes 12 muffins, but as I fill my muffin pan with batter to my usual “2/3 full” per muffin cup, 8 good sized muffins was all the batter allowed. Cream the butter and sugar, then add the egg and orange rind. Stir together the flour, baking powder, and salt. Combine the milk and orange juice. 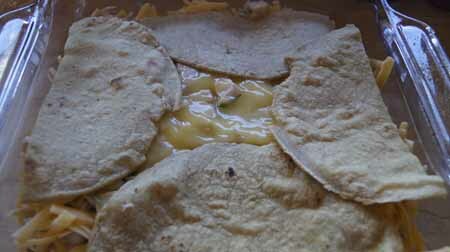 Add the flour mixture alternately with the milk-orange juice mixture, mixing well after each addition. Fill muffin cups 2/3 full. Bake at 400˚ for 15-20 minutes. These are very good. Cake-like, but not too sweet for breakfast. 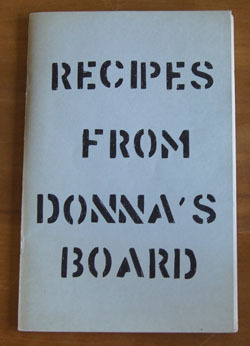 Cookbook #164: Recipes from Donna’s Board, Sierra Cahuenga District #15, 1980-1981. 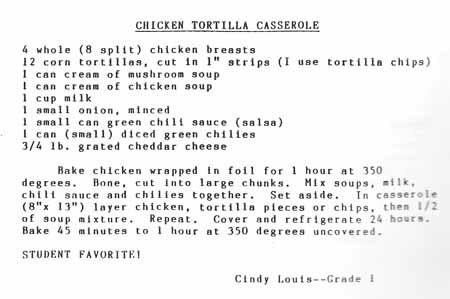 This little community cookbook was compiled by Lorraine Moore, the vice president of the Sierra Cahuenga District Women’s Club Board in 1980-81. Donna Smith – “Donna’s Board” – was the president at the time. My mother was a member of the Sun Valley Women’s Club, one of the clubs in the Sierra Cahuenga District. I remember her talking about going to those meetings for years, and I think she served for a time as secretary – she was an excellent typist and great at organizing. The California Federation of Women’s Clubs is still an active service organization, although the Sun Valley chapter no longer exists. What jumps out at me the most when I open the pages of Recipes from Donna’s Board is THAT IT IS IN ALL CAPS! Since it was written in 1980, I know it must have been prepared on a typewriter. Someone sure liked the ‘caps lock’ key. The recipes are interesting. Lura Lovick, a friend of my mother’s, contributed Date Nut Bread. I’d like to make the Green Chile Cornbread and the Poppy Seed Strudel. The Fresh Apple Cake with Good Frosting sounds good too, although I’d leave off the frosting. Over half of the book is desserts! “Mom’s Applesauce Cake” sounds like a recipe that I used to make, but lost. Sun Valley Woman’s Club contributed Yum Yum Cake and Chicken Florentine. “No Name Dessert” is made from butter, soda crackers, chocolate chips, coconut, and sweetened condensed milk – sounds weird to me. Baked Chicken Sandwiches sound particularly yucky: you mix mushroom soup with chicken, put between crustless white bread slices, dip in egg, then roll in crushed potato chips before baking. 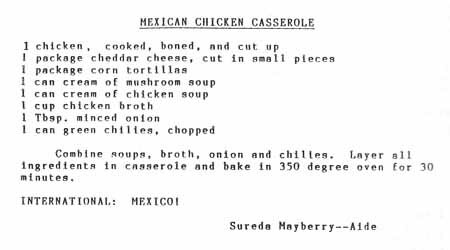 The casserole recipes abound with canned soups. Several molded salads are included, food favorites of the 60s and 70s. The Beef Stroganoff has cream cheese in it as well as sour cream. I’d like to try the Tostada Quiche. I decide to try Donna’s Carrot Cake for this blog. Carrot cake is a standby of many American cooks – at least those of us who grew up in the second half of the twentieth century. The basic recipe has lots of eggs, sugar, oil and carrots. Sweet and delicious, especially with cream cheese frosting! 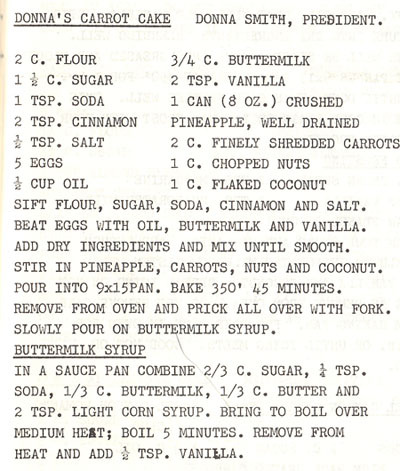 Some versions of carrot cake include pineapple, as in Donna’s recipe (below), but I have never made that type before. I like Donna’s version because it also includes coconut (love it) and walnuts (a bit of nutrition). I decide to make half of this as “muffins” to qualify this treat as breakfast food. The other half of the batter will go into one 8 1/2 x 4 1/2-inch loaf pan. I research cooking times using a favorite online reference. 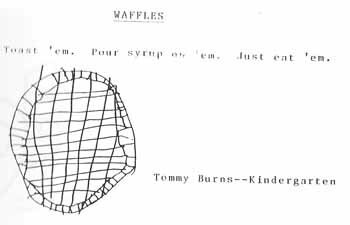 I skip the “buttermilk syrup” topping. 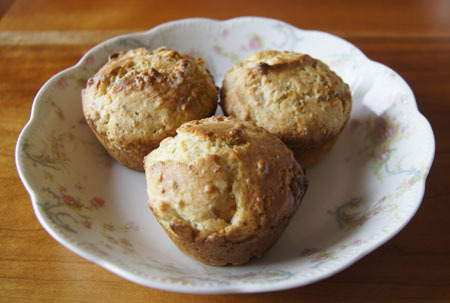 Since the muffins cooked better than the loaf, I’ve written this recipe as “muffins”. Stir together the flour, baking soda, salt, and cinnamon. Set aside. Beat the eggs with the oil and sugar until fairly light. Add the buttermilk and vanilla and mix again. Add the flour mixture and mix just until all the flour is incorporated. Stir in the pineapple, carrots, nuts, and coconut. 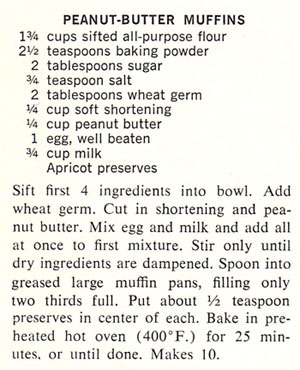 Spoon the batter into 24 muffins cups. 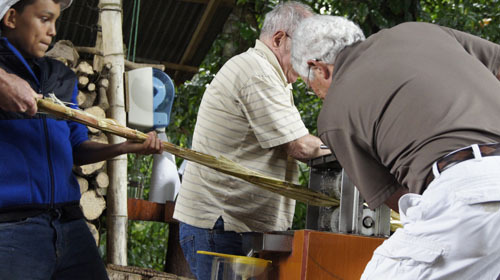 Bake at 350˚ for 30 minutes, or until they test done with a toothpick. Well, these were absolutely delicious! They have enough sugar in them to make me want “more, more, more!” But hey, they are dense with carrots and nuts and pineapple in them too, good healthy foods . . . I only had one for breakfast even though they called to me for awhile. This batter is really dense, which is probably why the loaf that I cooked was a little un-done in the center, even after careful toothpick-testing. If you prefer loaves, cook the batter as two 8 1/2 x 4 1/2-inch loaves at 350˚ for at least 55-60 minutes. 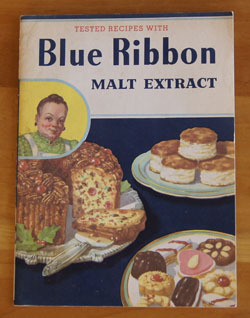 Cookbook #145: Blue Ribbon Malt Extract, Premier Malt Products, Inc., Peoria Heights, Illinois, 1951. How did this booklet get into my collection? I am clueless. I just wrote a couple posts about bagels and touched on the ingredient “malt syrup” – so not surprisingly, Blue Ribbon Malt Extract caught my eye when I searched for a book to cover this week. What is malt syrup? 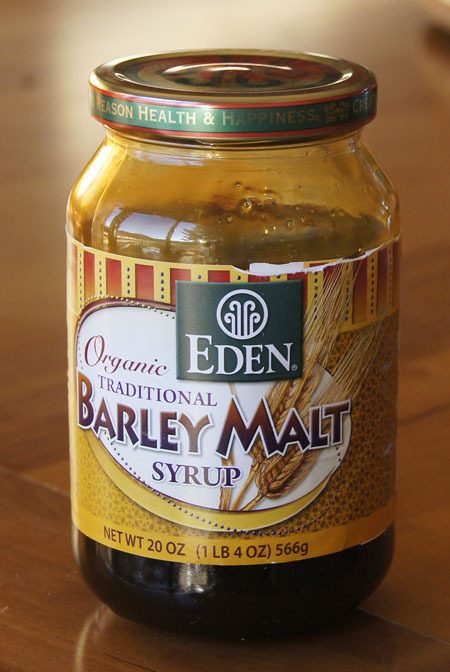 I found online that malt syrup is (generally) made from barley. The barley is soaked in water just until it sprouts and then it is dried – a process called malting. The sprouting process develops several different enzymes that break starches into sugars. Malt syrup is mostly the sugar maltose, along with complex carbohydrates and a bit of protein (and some vitamins, see below). It’s about half as sweet as sugar. 3 pounds of malt syrup in a can! Now, that’s a lot when you use so little for each recipe or for nutrition! What did people do with all that malt syrup? 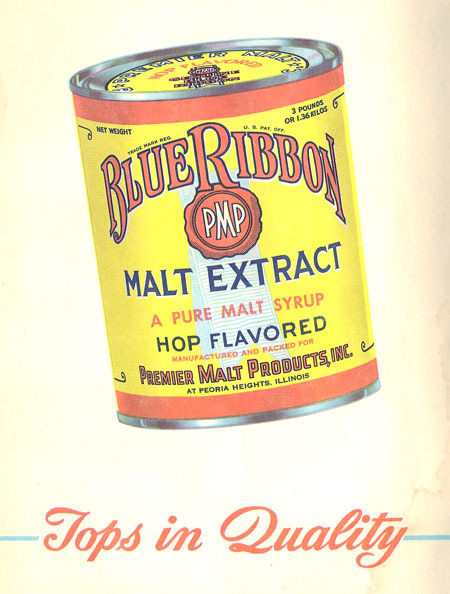 Back to my cookbook, Blue Ribbon Malt Extract. 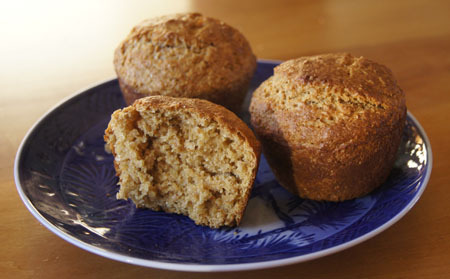 I decided to make Bran Muffins for this blog post. Since I want a good feel for the flavor of malt syrup in baked goods, I decided to use 3 tablespoons of the syrup instead of just 1 teaspoon. The jar of malt syrup says to use 1 tablespoon less liquid for each 4 tablespoons of malt syrup in a recipe, so I have adjusted the recipe for this amount. Mix the flour, bran, paking powder, and salt and stir together. Blend the sugar, egg, malt syrup, milk, and oil and whisk until well mixed. Combine the wet and dry ingredients just until mixed. 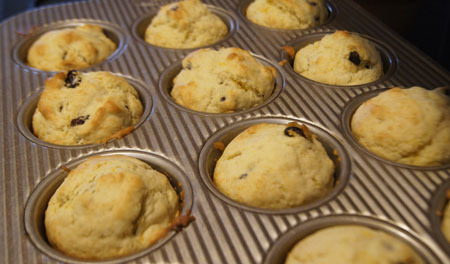 Fill 8 greased muffin cups with the batter. Bake at 425˚ for 15-18 minutes. The original recipe said to drop into “a well greased muffin tin”. I assume that means 12 muffins, but as I filled the muffin cups, I decided that 8 muffins was the proper amount. No time was specified; I tried 20 minutes and I think it was a little too long. I incorporated these changes in my version of this recipe, above. And how did these taste? I broke one open right out of the oven and devoured it. The fragrence and taste of the malt syrup was subtle but definitely there. I found these to be really filling. I ate one before a workout and believe they gave me lots of energy! I really enjoyed these muffins. But my husband? “They taste like sawdust.” Sigh. You will have to judge them for yourself. 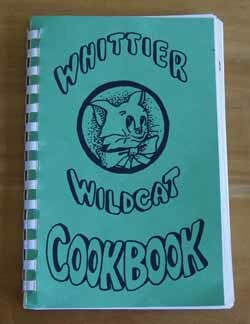 Instant favorite: A muffin recipe from the Whittier Wildcats Cookbook, this week’s 250 Cookbooks blog entry. These muffins are oh so good! 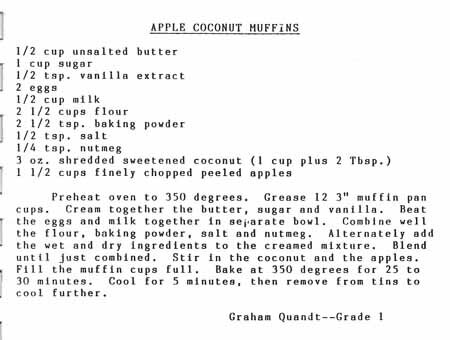 They pack a full cup of coconut and a cup and a half of apples into 12 muffins. I added some cinnamon and used fresh nutmeg. I think these are really “cupcakes”. Too rich to be called “muffins”. Maybe a little whole wheat flour will assuage my conscience. 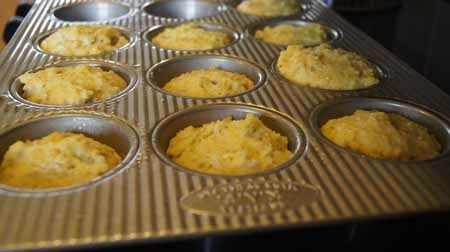 Prepare 12 muffin tins in your favorite fashion. In a mixer, cream the butter, sugar, and vanilla. Stir together the flours, baking powder, salt, and spices. Add the flour mixture alternately with the egg mixture to the creamed mixture, blending after each addition only until just combined. Stir in the coconut and apples. Bake at 350˚ for 30 minutes or until they are light brown on top and test done with a toothpick. Cool in pan at least 15 minutes before removing to cool on a wire rack. Be sure to let these cool before removing from the pan. I tried getting one out after only 5 minutes and – oops! It fell apart. So of course I had to taste it. And then go back for more. Addicting! 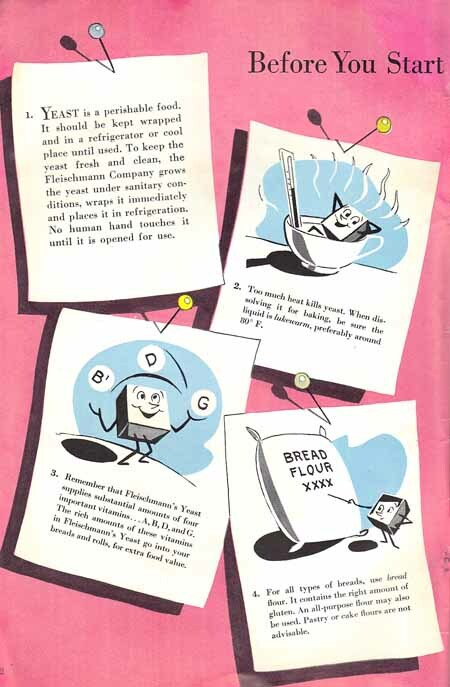 Cookbook #119: The Bread Basket, Standard Brands Incorporated, 1941. “‘Baking day’ isn’t on the American housewife’s calendar any more. For at her bakery or grocery . . . fresh every day . . . is a profusion of breads, rolls, cakes and pastries that’s one of the world’s wonders. “How tempting they are . . . how delicious . . . how cheap . . . and what a world of work they save! 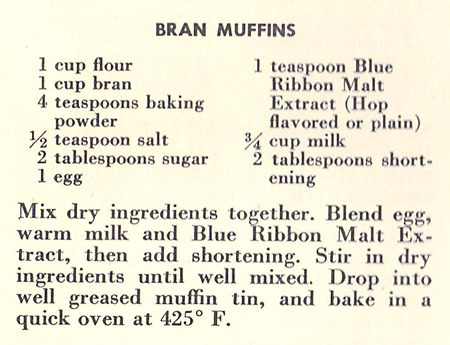 So begins this delightful 1941 cookbook. I smile as I turn the pages. 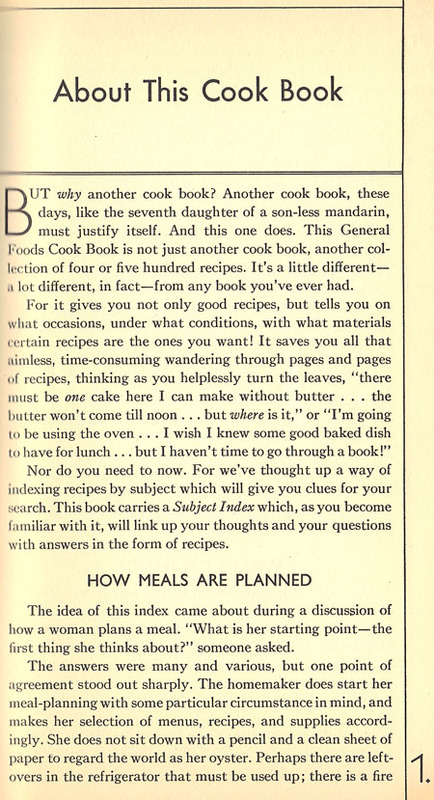 The copy right has expired on this cookbook, so I am going to share with you a few of my favorite pages. Let the book speak for itself! Bagles! 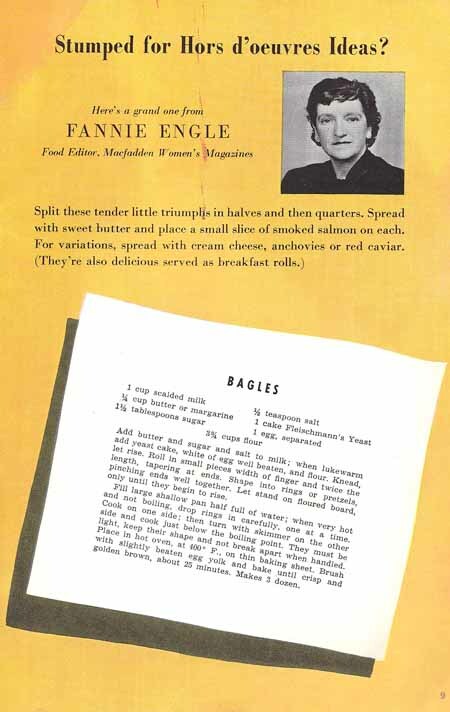 And yes, the recipe below is for “bagels”, as we spell it. I always google my cookbook titles. 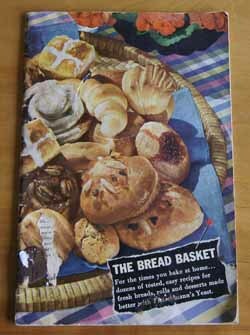 This time I find the Fresh Loaf website has reproduced a later version of The Bread Basket. The cover is the same, the layout is the same, but the content is different and refers to war rationing. This was one of my mother’s cookbooks, but she didn’t make any notes in it, nor are their food stains. She must have got it soon after she was married. 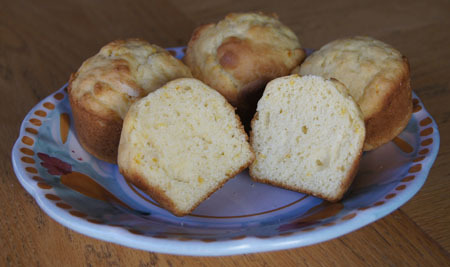 I decide to make “Corn Meal Muffins” for this blog. The original recipe is in the picture just above. I think it might be interesting to use yeast as the leavening in corn muffins instead of baking powder! I hope they turn out. A couple notes. The recipe calls for “scalded milk”. This is simply milk heated to just below boiling. This kills any bacteria that might interfere with the yeast and/or the taste of the bread. With today’s pasteurized milk, most (but not all) cooks consider this an unnecessary step. Scald the milk, then stir in the butter until it melts, then stir in the cornmeal. Add the brown sugar and salt. Let cool to lukewarm, then stir in the yeast, egg, and flour. 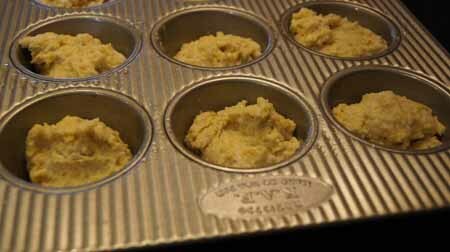 Grease a muffin pan (you will only need 10 of the muffin cups). Fill each muffin cup half full. Let rise one hour, until light. Bake at 375˚ for 22 minutes (or until they test done).